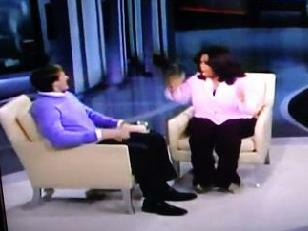 *Did you see Oprah with New Orleans Saints Quarterback Drew Brees last Friday? She obviously, had not ever seen him for herself. Oprah is the last woman you would think is not up on football and who plays it, especially if she was planning to interview a player. But then, in walks Drew Brees fresh off his Super Bowl win and she hadn’t taken the time to see him backstage before interviewing him or peek at a little footage to realize that the man has a famous birthmark on his right cheek. Uh oh, click over to WATCH the moment.